Submitted Photo The Young Spirits community dance group interacted with song, dance, and encouraging words with residents at Bridgeport Health Care Center. 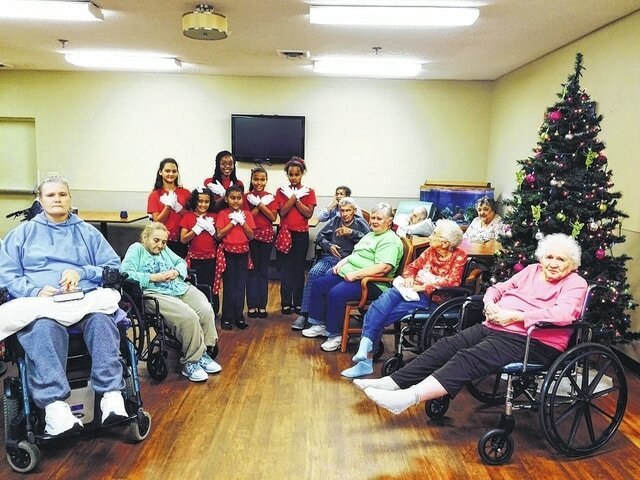 The mission of the dance team is to remind the residents of their value in our community. The residents interacted and responded with appreciation, smiles, and enthusiasm. The success of this program is attributed to the cooperation and support of Scioto Foundation. For additional comments or questions, contact Marcia Harris, program director at 740 353 8056. The Young Spirits community dance group interacted with song, dance, and encouraging words with residents at Bridgeport Health Care Center. The mission of the dance team is to remind the residents of their value in our community. The residents interacted and responded with appreciation, smiles, and enthusiasm. The success of this program is attributed to the cooperation and support of Scioto Foundation. For additional comments or questions, contact Marcia Harris, program director at 740 353 8056.